Thin is clearly In amongst manufacturers of keyboard controllers. Mere months after the arrival of Edirol's slender PCR1, M‑Audio weigh in with the equally waif-like O2. But is it slim and trim, or just a lightweight? It's hardly original to observe that everything's getting smaller in today's technological world, but what's interesting about the most striking recent changes in the size of music-making equipment is that they've involved a lessening of physical thickness. I recently found my old Wall Street Apple laptop and was amazed to find that it weighs a ton and that most of the apparent bulk comes from the thickness of the computer. If you think about it, the third dimension of any type of gear is the one that brings no advantage to users — whereas the width and depth of a laptop, for example, give you useful viewing area and room for extended keypads. Edirol were clearly thinking along the same lines when they released their ultra-slim PCR1 controller (see SOS September 2004, or www.soundonsound.com/sos/sep04/articles/edirolpcr1.htm), and M‑Audio have now made the same kind of design leap to produce the O2 (for a little on how the two compare, see the box opposite). The initial response to the O2 tends to be that something so insubstantial can't be a serious professional product. I have noticed over the years that despite all the moves to smaller and smaller technology, we still tend to instinctively equate weight with value. However, when you consider the most recent Mac Powerbooks or Sony Vaios — hardly unprofessional pieces of hardware — this is clearly not a fair response. What's more, the O2's slim, light form makes it ideal for mobile work — in fact, it fitted into one of my laptop bags with plenty of room to spare on its own, and, handily, with just enough room to squeeze in my 12-inch Powerbook as well. Of course this is all fairly academic if the resulting product is so compromised that it doesn't do the job required of it. So; how does the reduced height impact on the usability of the keyboard? Well, the keys remain full size, so that the width of one octave on the keyboard is the same as on a 'normal' keyboard, and this is critical for players who have traditional keyboard skills, and are used to the lateral distance required to jump standard intervals like fifths and octaves. The main restriction that has had to be placed on the keyboard is that the distance the keys pass through when you play them is about half what you would normally expect. Like Simon Price when he reviewed the PCR1, when I first tried playing the O2's restricted-travel keyboard, even without it connected to a sound source, it felt very strange. However, there is a musical precedent for this type of action. While I was writing this review, I went to visit a writer/composer whose musical film I am directing, and he has an antique harpsichord. Sitting down to play harpsichord for the first time in years, I was immediately struck by how similar the action was to that of the O2! Despite this, I did find that it was initially more difficult to play the O2 and achieve the same subtle control of velocity which you can on a keyboard with full key travel (harpsichords, of course, aren't 'velocity sensitive' either). But as with so many things, once I started working on a song, I soon forgot about the actual keyboard I was using and found myself accomplishing everything I needed from a point of view of velocity sensitivity. As with so many things, the human body is fairly adaptable and this is certainly much less of a compromise than mini-keys which, for me at least, completely mess up my sense for note intervals. I suspect that the thickness of the O2 also dictates the use of rubber rocker switches as performance controllers in place of the more usual wheels for pitch-bend and modulation — clearly, wheels require a fairly deep casing. But the choice M‑Audio have made is an excellent compromise, both in terms of its low profile and usability, particularly on a unit which is designed to be regularly chucked in and out of laptop bags — a Korg-type joystick or Roland three-way 'bender' would be too vulnerable in this respect. I had never tried this type of rocker switch before, but it definitely represents a new approach to controlling pitch bend, and I actually found it to be quite inspiring. Of course the range of pitch-bend over which the rocker operates is set on the target devices, but the Octave rocker allows you to shift up five octaves and down four from the nominal central position, so the O2 will cover an 11-octave range. The Octave rocker switch also doubles as a Transpose control — pressing both sides simultaneously puts it into Transpose mode, and then you use the '+' and '-' sides of the rocker to shift pitch in semitones instead of octaves. The remainder of the controllers on the O2 are much more conventional, with the standard fully assignable knobs and switches (eight of each) which are to be found across the rest of the M‑Audio range of controllers (and, prior to their buyout by M‑Audio, Evolution's controllers, from which many of M‑Audio's current range are derived). Five more such buttons below the three-digit LED display allow you to access Advanced Functions (in tandem with the lower half of the musical keyboard), Global Channel, Mute, Decrement and Increment controls respectively. The single slider to the left of the display is not hardwired to volume (still my favourite feature of the Evolution 461C) but can be set to that function in any of the five non-volatile memory locations. 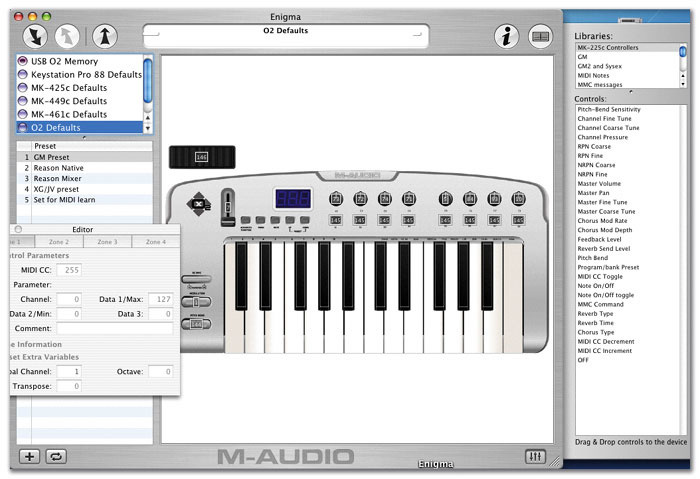 Once again, M‑Audio/Evolution's generic 'once-size-fits-all' editor/librarian software Enigma can be used to archive these memories, name them and view their settings. The version on M‑Audio's web site has already been updated to support the O2, and worked fine for me under Mac OS X (see the screengrab on the next page). The back panel of the O2 features a reasonable number of connectors, namely for USB, the 5V power supply (in case you are not powering from USB but using the O2 as a stand-alone MIDI controller), a single MIDI Output, a sustain-pedal input and a power switch. There is also a Kensington keylock port to prevent the highly desirable O2 going for walks (sensible — you could almost fit it in the inside pocket of a greatcoat!). The MIDI Output allows the O2 to act as a 16-channel MIDI interface output from the computer as well as a stand-alone MIDI controller. Unfortunately, as there is no MIDI Input, it does not allow you to input MIDI data to your host computer unless it can be generated on the keys, rocker switches, knobs or buttons of the O2 itself (I am always looking for a way to plug my MIDI guitar in without needing to run a second USB MIDI Interface). I've covered the way that M‑Audio and Evolution products deal with the assignment and range of controllers to knobs, buttons and sliders in my recent reviews of their products (see October and June 2004's reviews of M‑Audio's Keystation Pro 88 and Evolution's 461 at www.soundonsound.com/sos/oct04/articles/keystation.htm and www.soundonsound.com/sos/jun04/articles/evolutionmk461c.htm respectively). The only difference here is that there is no room for a numerical keypad on the O2, so the upper half of the keyboard is used to enter numerical values, in the same way that the lower half is used to decide which of the Advanced Functions you want to access. The names of these functions and the numbers are printed above the relevant keys on a 'scooped-out' concave edge below the main panel (see the main picture at the head of this review). This is nice, as you can nearly always read the legending, no matter what angle you're at to the top panel, which is not always the case on keyboards with silver casings, especially under bright lighting. 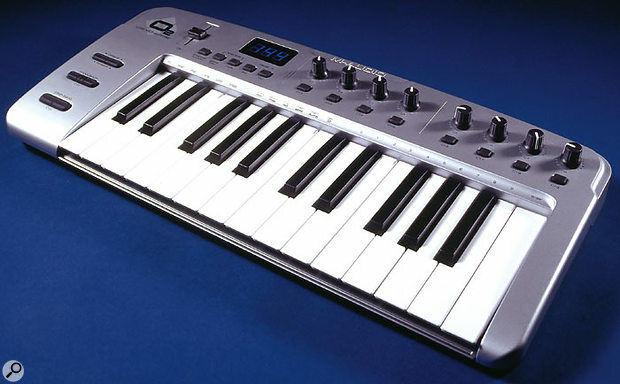 This use of the musical keyboard to access functions makes it very easy to select and enter new values for all the Advanced Functions, by simply holding the Advanced Button with one hand, selecting the function with the other, and then hitting the keys that represent the values immediately afterwards. Of course, if you have a computer connected, then it is always going to be quicker and easier to create and edit presets with the Enigma software, but for quick changes where you don't want to bother opening up Enigma up, the system works very well. The five memories which are preset as standard in the O2 cover a General MIDI Preset, two Reason presets, one for Yamaha XG or Roland JV synths, and one which M‑Audio describe as 'Undefined CCs for MIDI learn'. This last one is particularly useful, as applications like Logic and Ableton Live do not have default settings for controllers. Recommended practice for such applications is to use controller numbers which do not have a specific function associated with them, so this preset contains controller numbers which are less commonly used. You then put your application into Learn Mode, move the control on the O2, and then the application will use that MIDI controller without you having to spend time deciding which number you should be using. The Quick Start Guide which comes with the unit is extremely basic and really only covers those functions which any reasonably intelligent MIDI- and computer-literate person can figure out for themselves. To learn anything which you can't instantly figure out, you need to open up the fuller International User Guide, which is supplied with the O2 as a PDF (but only print out the 20 pages in your own language, otherwise you will end up wasting a hundred sheets of paper!). This does go into quite good detail on topics like 'Assigning RPN/NRPNs to a Fader/Rotary Controller' and 'Assigning MMC Controls to a button', but I do wish the info was supplied on paper, rather than in a PDF. The O2 is a great example of how good things can come in small packages — just like modern laptops. With a little bit of familiarity, the reduced travel of the keys becomes second nature, and personally, I found the rocker switches for pitch, mod and octave a positive joy to use. Finally, there's the price to consider — and at just £119 including VAT, you'd have to say that it's great value for money. The obvious comparison for the O2 is the Edirol PCR1, which was the first of the ultra-thin controllers launched earlier this year. Unsurprisingly, the travel distance on the PCR1's keys is of a similar order to that of the O2, and it also does away with conventional wheels, opting instead for a rubber pad for pitch, and a roller-type arrangement for the mod wheel. The PCR1 has a suggested retail price of £229, which is considerably more than the O2 but firstly, there are some great discounts to be had on this price in the UK at the moment, and secondly, the PCR1 also acts as 24/96kHz-capable audio interface. You have analogue ins and outs on RCA phone jacks and a mini-jack headphone out. On balance, I would say that if you need the audio interface, then the PCR1 is the obvious choice, as you are killing two birds with one stone (and saving one USB socket for your sequencer dongle or other device), whereas if you just need the keyboard triggering, the O2 represents killer value for money. Apart from the PCR1, it's not wholly fair to compare the O2 with other controllers, as they're too dissimilar. There are full-travel mini-keyboards for around the same price, but they don't have the same dimensions and sleekness of the O2. If you want full-size and full-travel keys, then of course you will have to pay more, and also be less concerned about the space taken up by the keyboard. Ultra-thin profile mimics the latest laptops it will be used with. Full-width keys for chord and interval playing. Half-distance travel a little strange at first. Mastering the unusual pitch and mod controls needs practice. M-Audio have done it again in terms of price and spec. If you need a compact controller keyboard and your budget is very limited, but you would rather sacrifice key-travel distance than make keys narrower and therefore make chord and interval playing unpredictable, the O2 is the one for you.